VH1 save the music foundation has a new project between musicians and visual artists in partnership with Art at Viacom to help the preservation of music education in schools across the country. The project entitled “Art out loud” debuted yesterday. 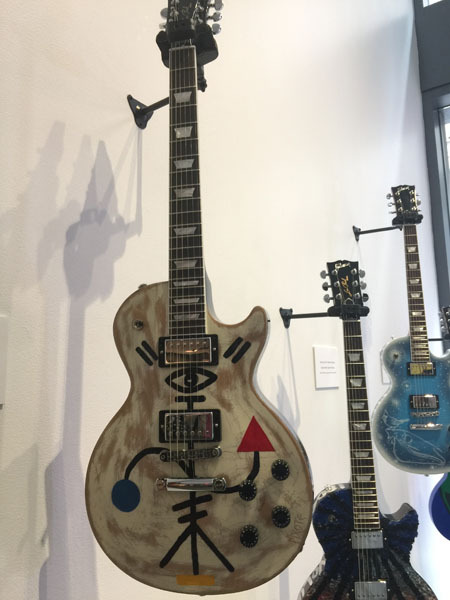 In celebration of their 20th anniversary the creation of 20 exclusive guitars were unveiled for the first time in advance of an auction that is set to take place in the fall. Several artists including Miley Cyrus, Patti Smith and Wyclef Jean have collaborated in designing special edition Gibson guitars with artists. Each visual artist was paired with a musical artist for inspiration on a creative concept. Gibson finished the guitars are their factory, making each one a truly unique piece. For Joao Saloman, who goes by Pixote, it was important that he get involved in this project of music education for kids. For him music is about healing and the world especially when more and more people are living in fear and manipulation. “Kids are super pure and we need to protect out children,” he said. As a musician turned visual artist the transition was organic for him, as he found that the two blend seamlessly into one another. He hopes to bring positivity, awareness and healing to the world through his art.